There’s an interesting dynamic in the past two episodes. The bad guys seem to desperately want to turn everything into a big, messy shounen-esque battle. 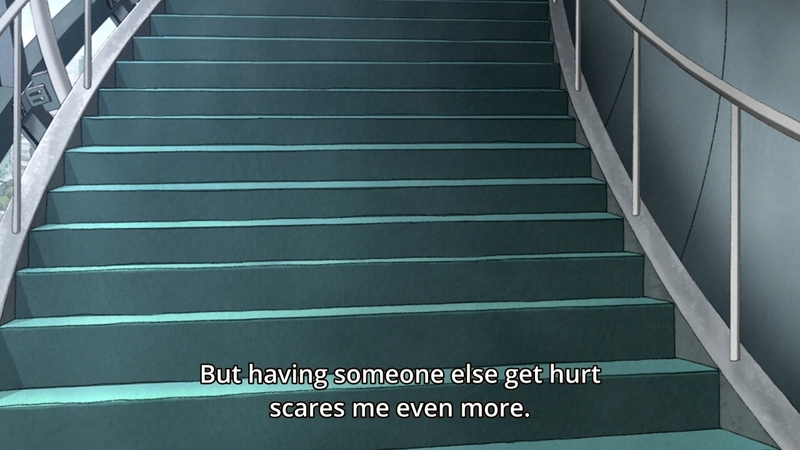 They even stand around and spout generic shounen-esque lines. 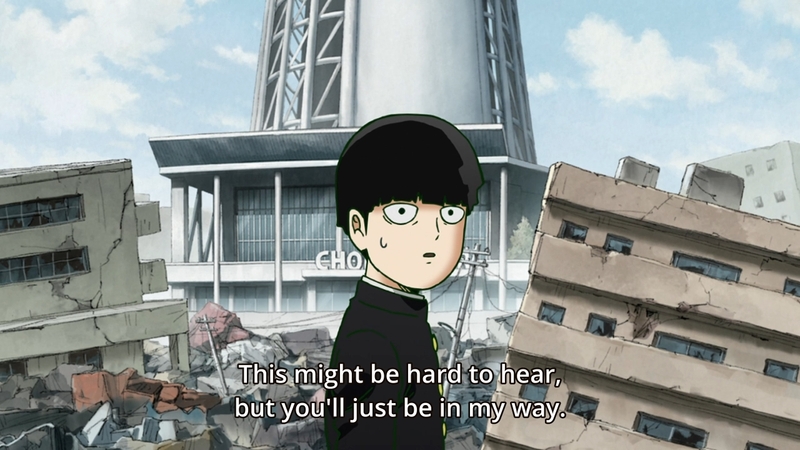 On the other hand, Mob wants to talk things out and thus make avoid engaging in said big, messy shounen-esque battle. And for the most part, he succeeds. This is also why the others keep failing. Ritsu and friends are trying to beat the bad guys at their own game, and unless you’re definitively stronger, you just won’t win. For example, when Sho confronts his dad, he’s like, “I’m as strong as the Ultimate 5 now!” Um, okay? If your father commands the Ultimate 5, why would you think that being as strong as them is good enough? I get that he wants to be acknowledged by his father. I get that he wants to prove that he can fight his father man-to-man. But in the end, that’s just folly. Plus, even if he wins this way, he’s just proving to his father thatmight makes right. Hatori is a complete non-starter. He doesn’t even get to talk to Mob as he just gets wrecked by Sho in one move. Minegishi looked like he was actually giving Mob some trouble, but of course, our hero wasn’t operating anywhere close to 100%. Nevertheless, when some Claw henchmen unknowingly freed Mogami from his prison, the evil spirit quickly becomes the biggest threat. He is about to kill the Minegashi until Mob somehow talks him down. After that, the guy just disappears. I guess he’s content to watch Mob’s development from here on out. Maybe he’ll return in a future arc or something, but whatever. In any case, Minegishi is grateful for Mob, so he actually helps out later. Yay for diplomatic victory. Who knows if this change of heart is permanent, but we’ll take it. 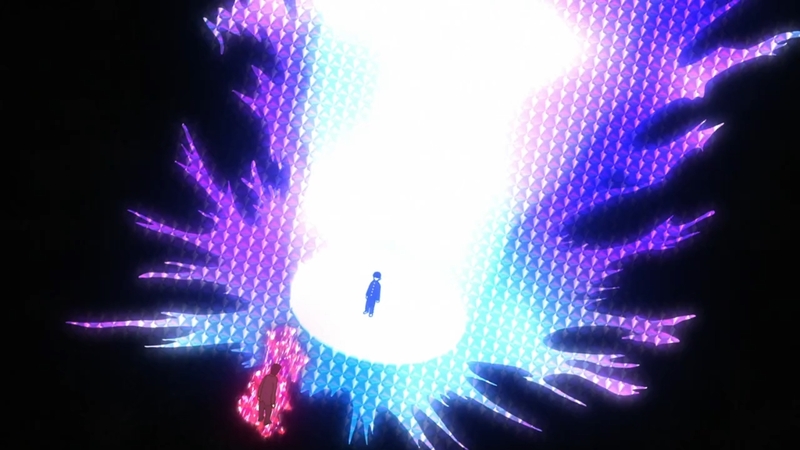 Ritsu, Teru and friends do actually manage to overwhelm Shimazaki at first, so the guy heightens his abilities to the point where he is only able to see espers. Nevertheless, this allows him to beat them all back and prepare for Mob’s arrival. Unfortunately, this leaves Shimazaki completely defenseless to Reigen of all people. 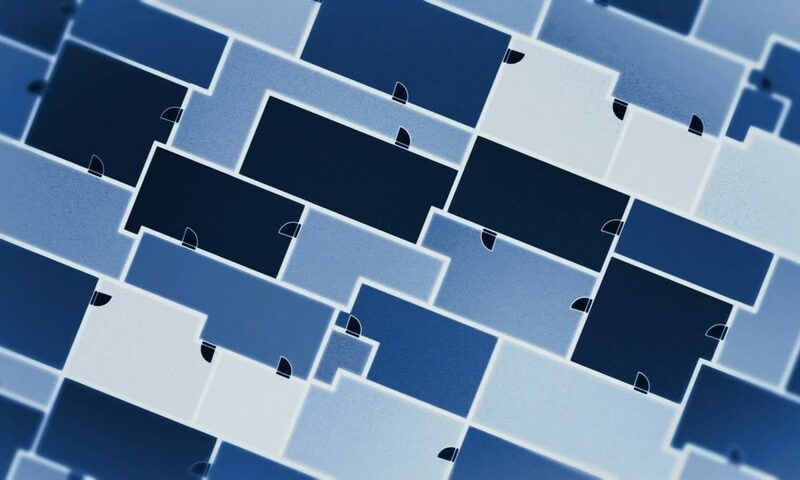 If you can only see espers, then you can’t see non-espers. That’s simple enough to understand. 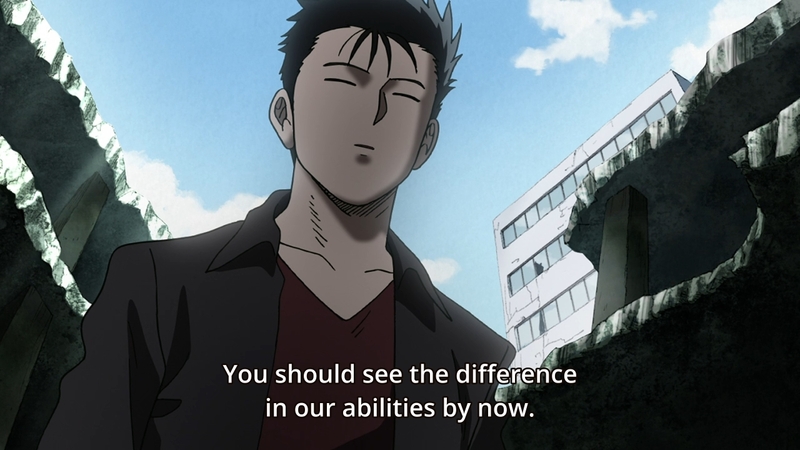 And when Mob finally does show up with his impressive aura, Shimazaki is too shaken to continue fighting. So this is kind of like a diplomatic victory? I mean, I suppose you can achieve peace through sheer intimidation. 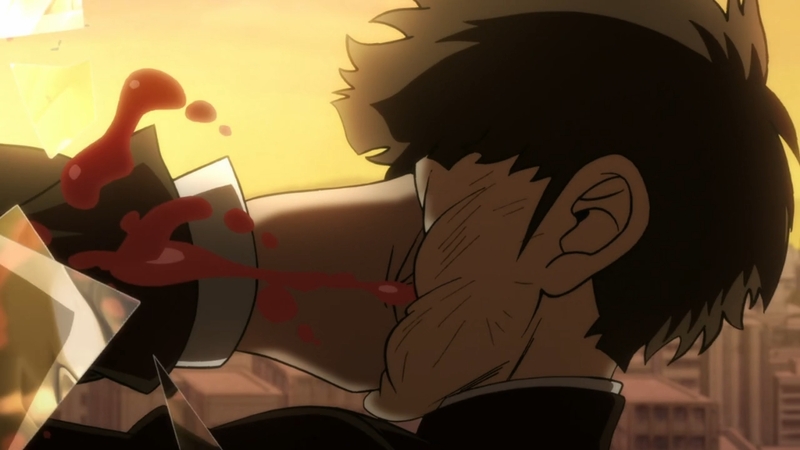 Last but not least, Mob goes one-on-one against Serizawa. 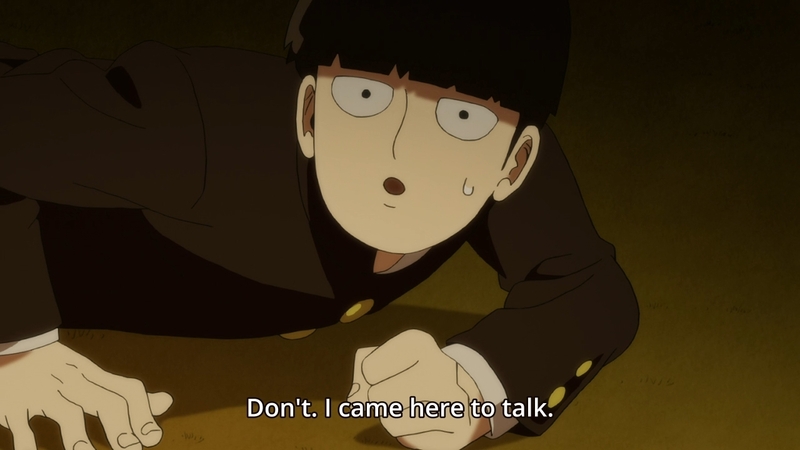 The latter is more than content to fight, but Mob just keeps talking and talking and talking. Eventually, he convinces the shut-in that Toichiro doesn’t see him as a person. Rather, he’s just a tool to be used. Moreover, if Serizawa is looking for a friend, then Mob will be his friend. Our hero then uses his powers not to defeat his enemy, but to show his enemy how much he understands them. Cool, I guess. 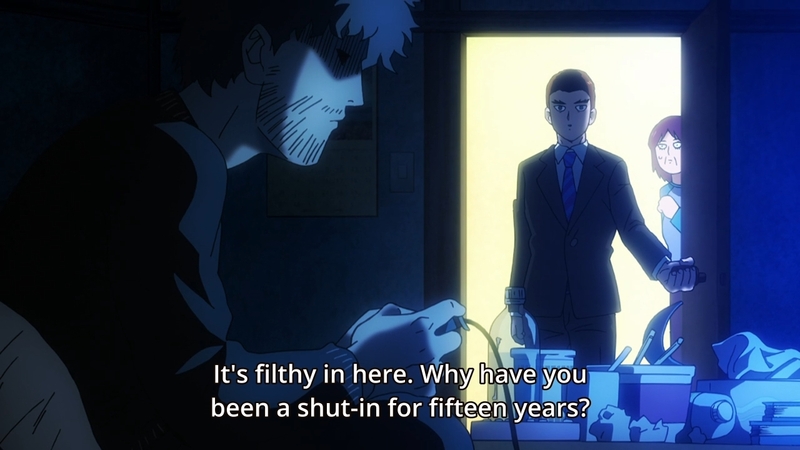 Mob’s grown a lot since the start of the series. 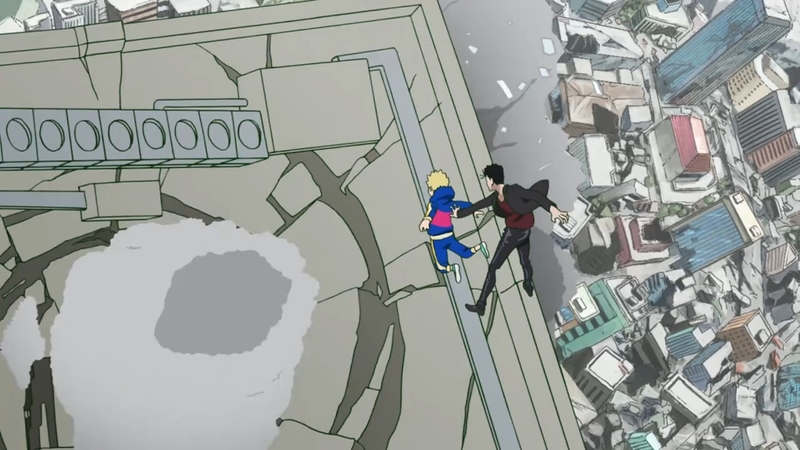 When walking up the tower to confront Toichiro, he admits to Dimple that he’s still scared, but unlike before, he won’t run away ’cause he has more important fears to worry about. He even takes Mogami’s words to heart. He won’t stop caring about others, but in order to protect them, he realizes that he’ll need to be firm with them from time to time. This results in Mob keeping Ritsu from joining him in the final battle for obvious reasons. Unfortunately, not everyone can be reasoned with. True to his character, Mob tries to talk to Toichiro, but the guy is too high on his on farts to care about things like frou frou nonsense like friendship and empathy. He’s one of those stereotypical wannabe Ubermensch who equates power to justice, so he thinks he can do whatever he wants as long as he’s the strongest. 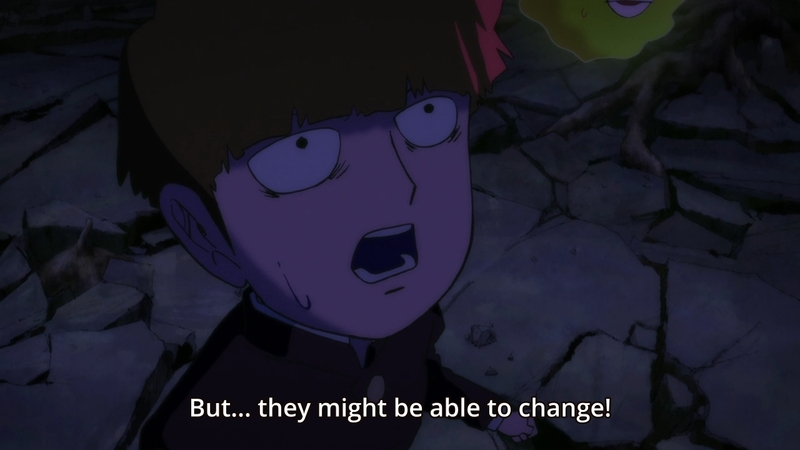 Nevertheless, it is amusing to see how Mob and Reigen both attempt to tackle the same problem from different angles. Our hero tries to reason with Toichiro with pure, straightforward honesty. 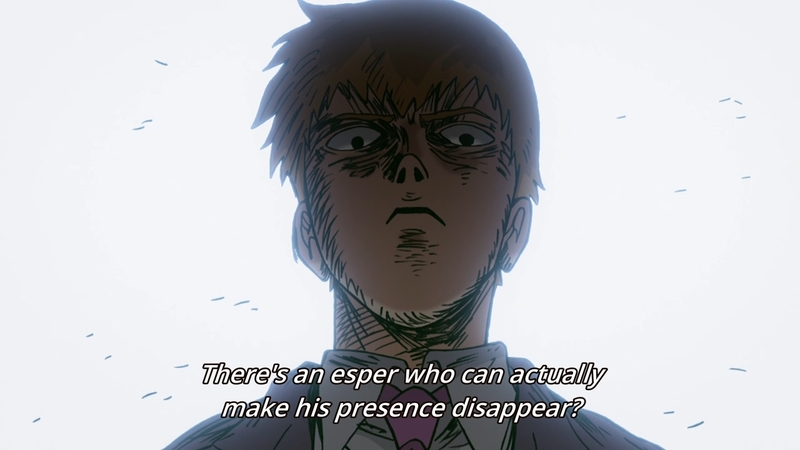 On the other hand, Reigen is a scam artist through and through. 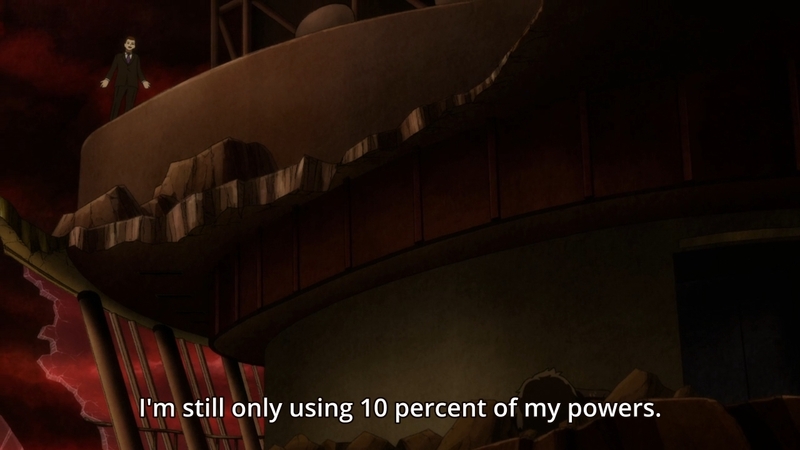 Maybe if he actually had any powers, he could have pulled a fast one on Toichiro. No such luck when you’re just a regular human, though. In the end, both strategies fail and Mob is forced to admit that some people just need to have some sense knocked into them. 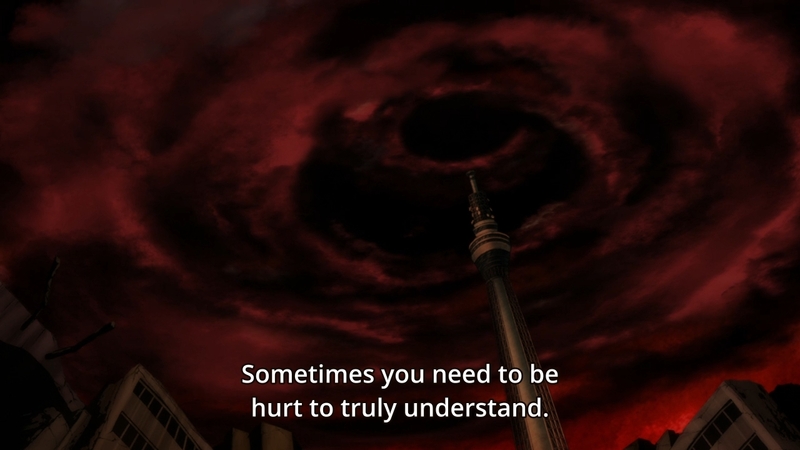 Having said that, I don’t expect to see the kid compromising his morals in order to defeat Toichiro. His primary argument is that there’s more to life than just pure destructive power, so I expect him to defeat the final boss by demonstrating this in some form or fashion. 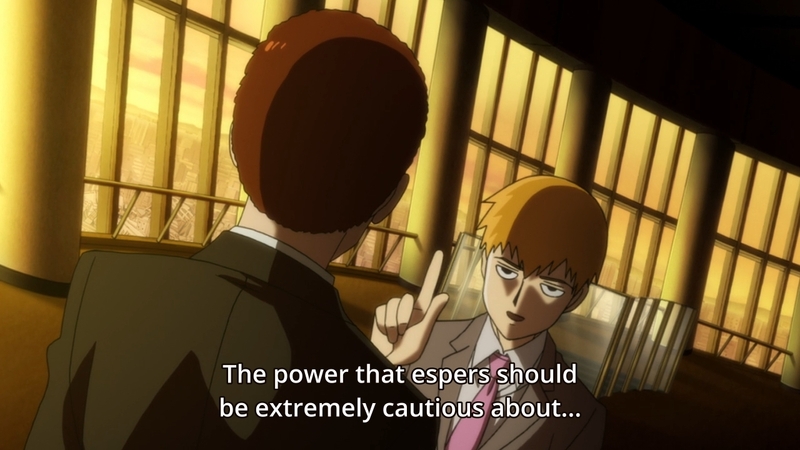 He just needs to impress Toichiro by showing that their esper abilities can be used in other ways. I just don’t know how he’ll accomplish that. Ah, if only his power could heal or something. But even then, I doubt that would impress Toichiro much. Maybe you just need to soften him up or something. Like how in games, if you want to recruit an an enemy character, you can’t do it when they’re at 100% health. You gotta whittle them down to less than 10% of maximize your chances. Ah well, I’m just rambling now. We only have one episode left. It’s not like I’ll have to wait too long to find out.